Taipei, Aug. 14 (CNA) Taiwan is looking to diversify its supply channels for its energy needs and minimize reliance on the Middle Eastern and Southeast Asian markets, President Tsai Ing-wen (蔡英文) said in the United States on Monday. In a meeting with New Mexico Governor Susana Martinez, Tsai said Taiwan recently signed a deal with an American company for the supply of liquefied natural gas (LNG). The deal signaled Taiwan's intention to expand its overseas energy supply channels, Tsai told Martinez, who had traveled to Los Angeles for discussions with Tsai on trade opportunities between Taiwan and the resource-rich state of New Mexico. The president was referring to deal state-run CPC Corp. Taiwan signed recently with Cheniere Energy Inc., an international energy company headquartered in Texas, to purchase approximately 2 million tonnes of LNG per year over a 25-year period with effect from 2021. During Martinez and Tsai's meeting, they also discussed possible cooperation between Taiwan and New Mexico in areas such as education, energy resources, and science research, National Security Council (NSC) Deputy Secretary-General Tsai Ming-yen (蔡明彥) told Taiwan-based reporters traveling with the president. After the meeting, Martinez accompanied President Tsai on a visit to the Ronald Reagan Presidential Library in Simi Valley before Tsai's departure for Paraguay later in the day. 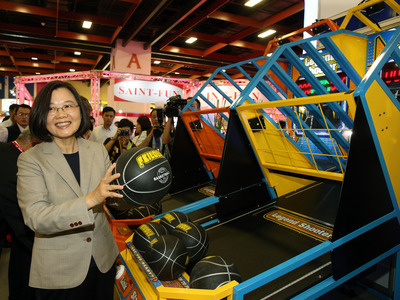 Tsai was in Los Angeles on a transit stop en route to Paraguay and Belize, two of Taiwan's 18 diplomatic allies.